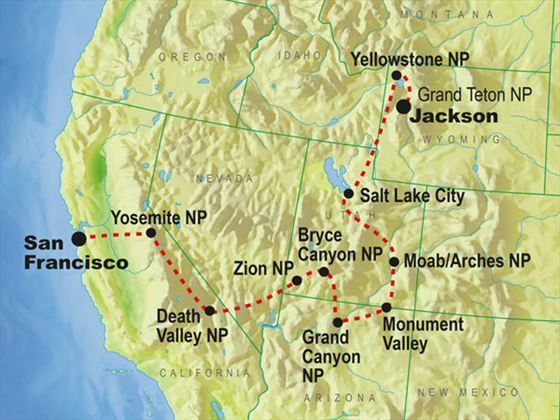 Begin your two week tour in San Francisco before journeying west through some of North America’s most beautiful national parks, lakes and canyons across six states. With stays in some charming and characterful lodges and cabins set in the most stunning locations, you will enjoy a unique experience on this small group tour. 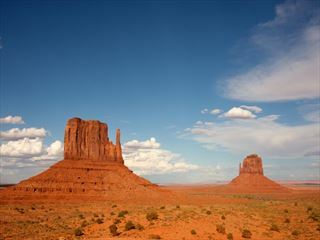 A Navajo guided backroads tour is included in Monument Valley, and there are also plenty of optional activities to choose from such as a white water rafting, Western horseback riding and an extreme off-road Hummer tour. Join your group this evening in San Francisco. You will be heading straight for the hills in the morning, so can you choose to add a few days in San Francisco before the tour starts if you would like to enjoy the sights of this vibrant city. 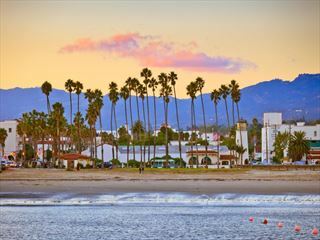 Leave San Francisco and head east through California’s historic gold country, travelling high into the Sierra Nevada Mountains. Once you arrive in Yosemite National Park you will walk an easy trail to the Giant Sequoias, before reaching your home for the next two nights – Yosemite Lodge at the Falls. As the closest property to Yosemite Falls, this is an idyllic spot, with the hotel landscaped to blend harmoniously with its surroundings. Today you can choose how you explore the stunning Yosemite National Park. You can cycle through the valleys, float down the river or hike along one of the many trails leaving the crowds behind. 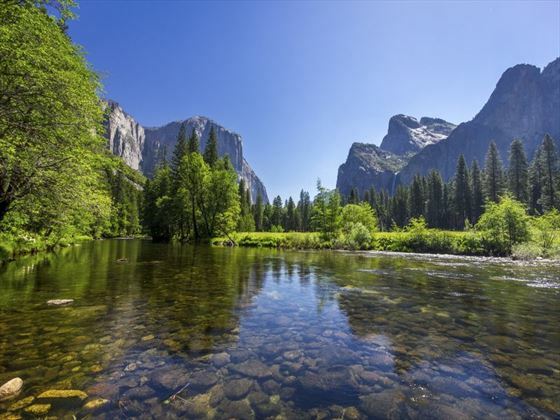 The famous sites situated along these trails include the wonderful waterfalls Yosemite Falls, Nevada Falls and Vernal Falls, and the breath-taking granite rock formations of Half Dome and El Capitan. Return to your lodge for the evening, and relax in comfort over a cocktail. Head to Utah and onto the soaring cliffs of Zion – one of the most spectacular National Parks. Named by the early Mormon settlers as their “promised land”, with the Virgin River meandering through the fertile valley below cathedral-like sandstone walls. When you arrive you will enjoy a hike along this beautiful Virgin River, and area considered to be one of the best hiking areas in the Southwest states. An early start to allow you to enjoy the truly spectacular Zion National Park. Warm up by taking a short hike from the valley floor to the Lower Emerald Pool, and then pick up the pace to the Upper Emerald Pools where you will find Zion’s beach, and can stroll along the Riverside Walk section of the Virgin River. You will then leave Zion, climbing to an elevation of over 8,000 feet and traversing the high plateau to Bryce Canyon National Park. Enjoy exploring this fascinating natural amphitheatre of pink, orange and white sandstone spires known as hoodoos. You have several hiking options of different levels of exertion with the Peek-a-Boo Loop Trail taking you right among the rock formations or take a stroll along the Queen’s Garden Trail, alternatively take it easy and enjoy photographing the ever-changing shadows and hues in this stunning setting. 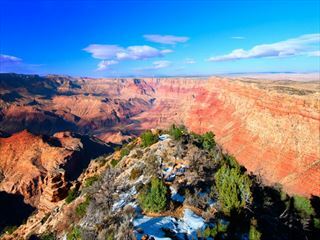 Head to the awe-inspiring Grand Canyon. Stretching for 300 miles and plunging to depths of 6,000 feet, this spectacle is difficult to comprehend. Either take a flight over the canyon or hike the trail to Plateau Point. Tonight you will stay at the historic Grand Canyon Lodge, where you can enjoy the quiet serenity of the North Rim. Accommodation is in western log cabins and you can relax in the Rough Rider Saloon and Lodge Dining Room. The red sandstone monoliths and spectacular sunsets of Monument Valley have been the backdrop to countless Westerns, and the best way to experience it is on a Navajo guided backroads tour. As you listen to stories of the history of the Navajo nation and discover geological wonders and petroglygh drawings of animals, you’ll understand why this place is so special. Continue southbound towards Moab which will be your base for the next two nights, giving you the opportunity to explore the Arches National Park and take part in some exciting activities. The stunning redstone arches have been created by millions of years of wind whistling down the west slope of the Rockies. Here you have the opportunity to hike through this stunning landscape and admire landmarks such as Delicate Arch. Alternatively, you can choose to take an extreme off-road hummer tour or a float trip down the Colorado River or explore by mountain bike. Your next destination is Salt Lake City, where you will have a city tour with a local Mormon guide to see the city from a local’s perspective. With two nights in Yellowstone National Park, you will have time for some serious wildlife spotting, including grizzly bear, wolf, bison and elk. A fire in the 1980’s actually destroyed much of the park, but is has recovered to such an extent that it is a living monument to Nature’s power of regeneration. 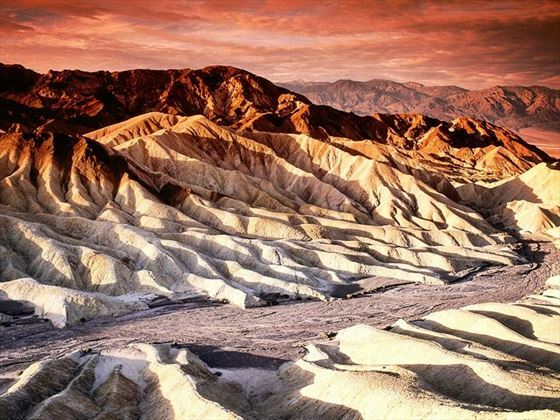 It is one of the most geothermally active places on the planet, which put simply means that you will see hot springs, erupting geysers and bubbling mud pools. You will be spending two nights at the Lake Yellowstone Lodge & Cabins, which was built in 1891 and restored to its former glory in 1990. Sitting on the shores of Yellowstone Lake, this stately hotel is listed on the National Register of Historic Places. Accommodation is in cabins dispersed through the hotel grounds. 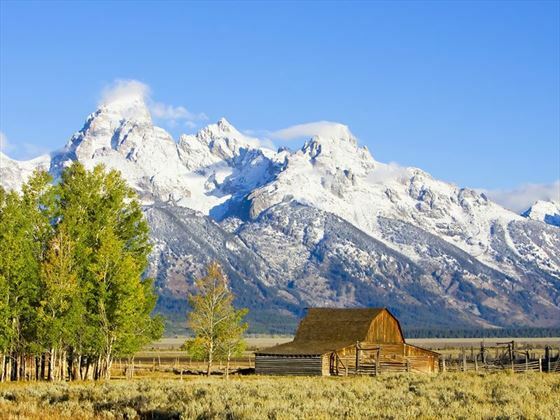 Continue your journey through Wyoming, travelling through the Grand Teton National Park where you have a scenic ferry included across Jenny Lake and the chance to hike up to Inspiration Point past waterfalls to a breath-taking viewpoint. Your tour will then finish in the town of Bozman.